ActioNet, Inc. recently became a Sustaining Member of the Pacific Forum, a nonprofit, private, foreign policy research institute that operates as the Asia-Pacific arm of the Center for Strategic and International Studies in Washington, D.C. Founded in 1975, the thrust of the Forum’s work is to help stimulate cooperative policies in the Asia-Pacific region through debate and analyses undertaken with the region’s leaders in the academic, government, and corporate arenas. The Forum’s programs encompass current and emerging political, security, economic/business, and ocean policy issues. It collaborates with an extensive network of research institutes around the Pacific Rim, drawing on Asian perspectives and disseminating its projects’ findings and recommendations to opinion leaders, governments, and publics through an active outreach program. An international Board of Governors guides the Pacific Forum’s work. It is chaired by Dr. Joseph S. Nye, Jr., former U.S. Assistant Secretary of Defense for International Security Affairs. 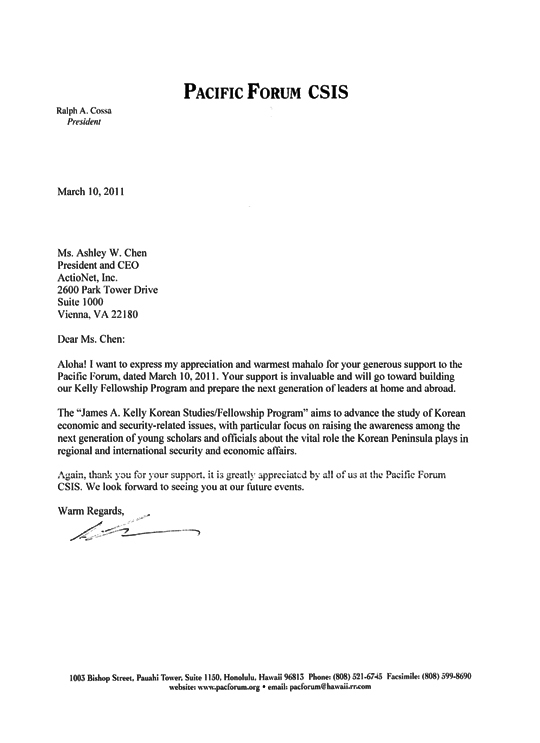 The Pacific Forum includes the Honolulu International Forum, which meets regularly and informally with journalists, scholars, and political leaders like Secretary of State Clinton, scholar Michael Green, journalist Peter Beck, and the current commander of the U.S. Pacific Command, Admiral Robert Willard. Forum subjects range from the impact of technology in Asia to the relocation of U.S. Forces to Guam. Active members of the Honolulu International Forum include international political leaders, ambassadors, noted journalists, governors, senior military leaders, and members of congress. ActioNet, Inc. is one of only a few contractors with membership in CSIS and participation in the HIF.